One of the UK’s largest motorhome rental suppliers, Just Go Motorhomes offers luxury motorhomes to tour across the Kingdom. Its motorhomes are super for families, friends and loved ones and are ideal for visiting national parks, landmarks and areas of outstanding beauty. 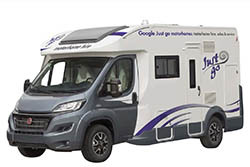 Just Go Motorhomes has one location in Hertfordshire, just northwest of London, which is easy to get to from Heathrow Airport, Gatwick Airport, Luton Airport and London Stanstead. Pick-up your vehicle here and explore the UK before returning it back to its sole branch. Five ranges to choose from. Motorhomes offered by the supplier include two-, four- and seven-berth with luxurious features and plenty of interior space. All motorhomes are made by Ford and Fiat to ensure their reliability and comfort. The Scout is the smallest motorhome and is suitable for couples or small families, with one permanent rear bed. For extra space and added comfort the Voyager also sleeps from two to four but has an extra spacious interior and a larger kitchenette. The Rambler is for larger groups, sleeping a maximum of six people, and has three double beds. If budget is a concern opt for the Nomad, a six-berth compact motorhome. This vehicle has permanent bunk beds in the rear as well as an overcab bed and comfortable bench seating that converts into an additional double bed. Just Go Motorhomes also has extra features available to make your trip that much more comfortable. Linen sets are available in both single and double size complete with a cosy duvet, and a generator can be hired for times when you cannot find an electrical hook-up. Motorists can also hire mountain bikes for themselves and the kids to go on further explorations. This 2 berth unit offers easy and economical driving an ideal choice for couples It comes with spacious living area which converts to sleeping area when required. In keeping with Just Go detail to luxury all that is needed is a press of a button to lower down a large and comfy double bed..
All Just Go Motorhomes UK are nearly new with no campervan over 1.5 years old. In addition these vehicles are regularly serviced and well maintained ensuring you will have glitch free trip. Just go, Redhill Farm, Harlington Road, Toddington, Bedfordshire, LU5 6HF. The location just 15 miles off the M25 and beside the M1 provides easy access to all nearby airports. Motorhomes can be taken to Ireland, but an additional charge currently set at GBP70 will apply. Just Go provide campervan hire UK from all key airports.